Heyo, lovely Real Life RD readers! I’m Alexis, the donut-loving dietitian behind Hummusapien and Alchemy Juice Bar + Cafe. Robyn and I became internet friends before chia seeds were cool and feel even more madly in love when we met in person last year. We’re basically twins. I help people discover the art of eating happy and living fully. I talk a lot about avocados and salted dark chocolate and not getting mad at unicorn frappuccinos for being unicorn frappuccinos. Every Wednesday I share a day of delish eats, so I went back through the archives to share this baby with you while Robyn is in another country eating fresh feta and drinking all the coffee. Hope you enjoy! I’m currently in the process of moving to another apartment in German Village so life is kind of all over the place. Kind of as in totally. But that hasn’t stopped me from smoothie slurping! This blend was a bunch of frozen wild blueberries, a handful of frozen dark sweet cherries, frozen spinach, chocolate Vega, a Medjool date, spirulina, almond butter, hemp seeds, a splash of vanilla extract, cinnamon, and almond milk to blend. I drank it out of a cup from my bestie’s bachelorette party a few weekends back which obviously made it taste even more delish. 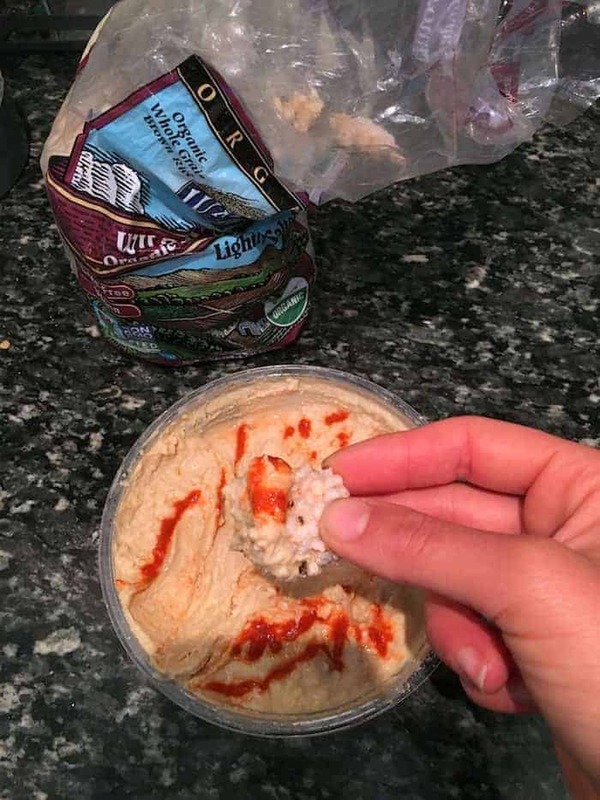 I was craving salty pretty much immediately after so I had a brown rice cake with Oasis roasted garlic hummus and sriracha. So dreamy! Lunch was leftover Quinoa Fried Rice (the boyf makes it now!) 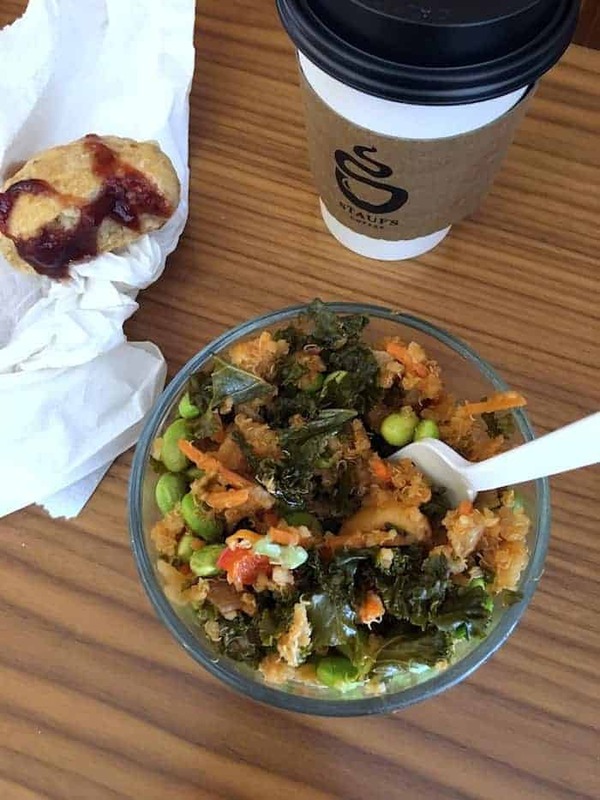 with edamame and roasted cashews added plus a random but very tasty sourdough biscuit that someone at work made paired with the local strawberry rhubarb jam, of course. Plus several bites of new blueberry muffin no-bake bites. Recipe testing galore! 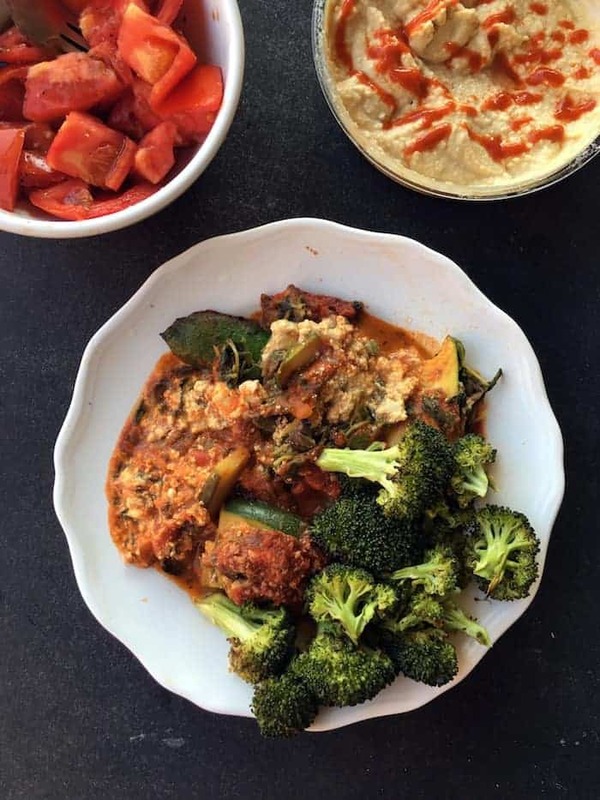 Dinner was The Best Vegan Lasagna with roasted broccoli, hummus, and tomato with balsamic, salt, and pepper (a local goodie that was about to go bad). I made the lasagna with zucchini rather than pasta (mistake) because I had like five in the fridge. It was a lot more soupy and though it was still tasty, I will definitely use pasta the next time. 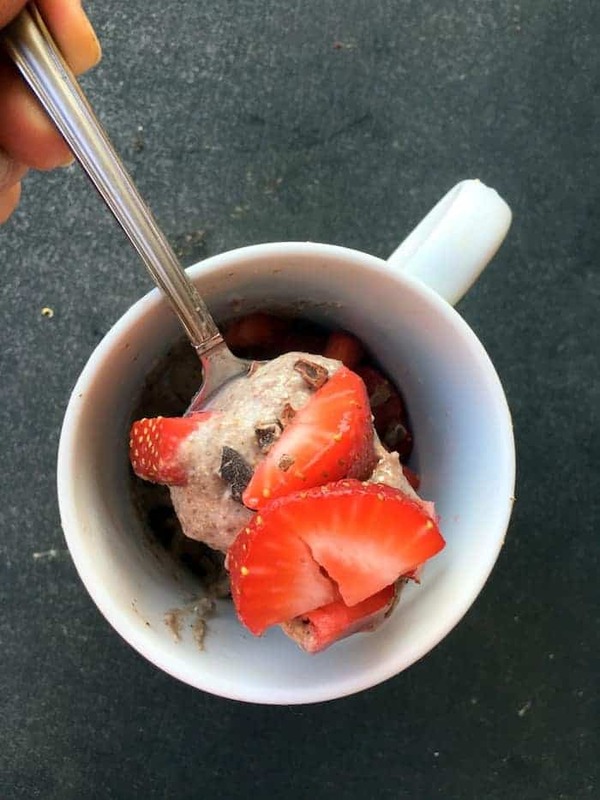 After dinner I scarfed down leftover Strawberries and Cream Chia Pudding with cacao nibs and strawbs for dessert. It was consumed in 2.8 seconds. I couldn’t resist a few squares of dark chocolate as we packed and unpacked and packed more and unpacked more. Fun stuff! 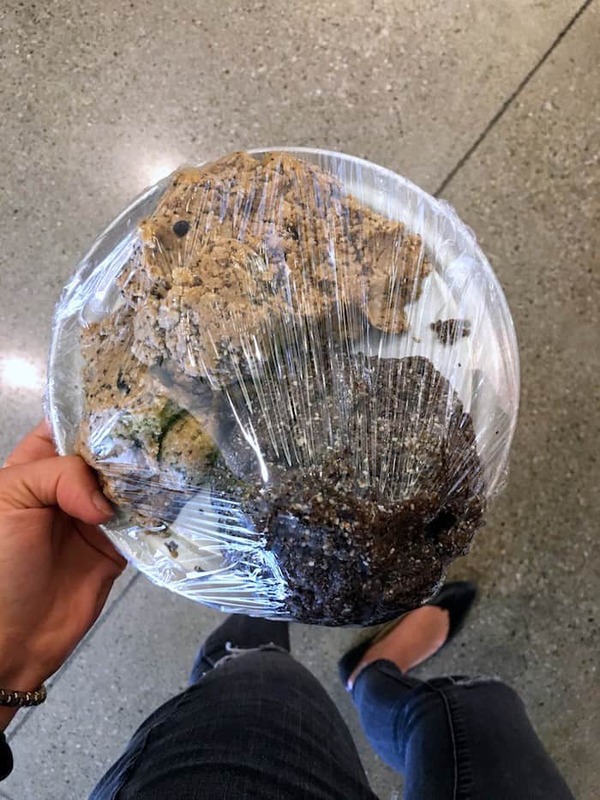 cant wait for the blueberry no bakes!! So many good “bites!” I always microwave anything with chocolate chips! I’ve made lasagna with zucchini before and found it too be soupy also! I guess the zucchini was so moist and I probably overcooked it. I’m in the process of moving right now too, too funny! It definitely makes life messy, in a good and bad way! And that strawberry rhubarb jam sounds FANTASTIC. I have some of those rice cakes in my pantry, and Gingerade is my favorite flavor! 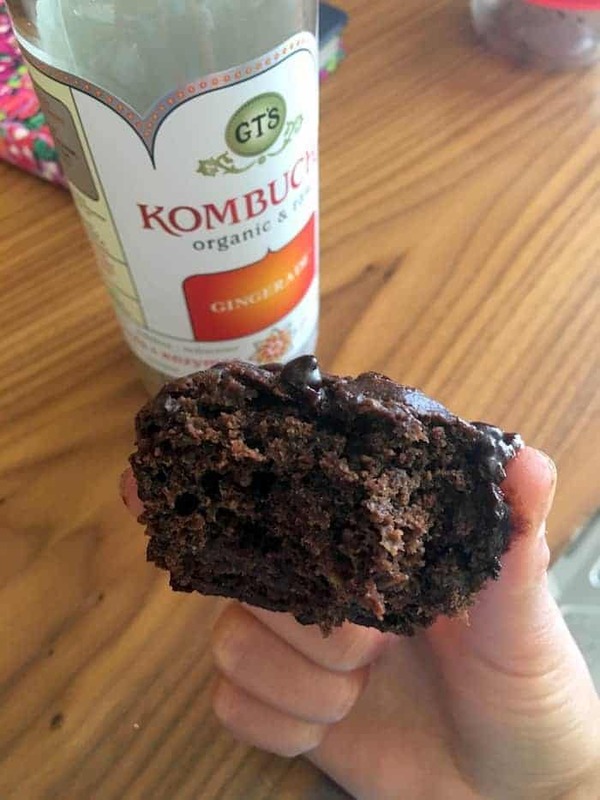 Gotta try those zucchini muffins one time! Moving is the worst, but at least it’s summertime and you don’t have to worry about moving in the snow or rain! I have been loving on rice cakes and hummus lately! People make fun of me, but I genuinely do LOVE rice cakes (but only the Lundberg brand because they actually have some taste/texture)! Right?! Other brands taste like styrofoam…eeek! Good luck with moving!! P.S. That watermelon bowl looks SO good! I totally thought that sourdough biscuit with jam was a jelly doughnut. I agree with Kate, anything with chocolate chips should be microwaved! So much more melty and amazing. 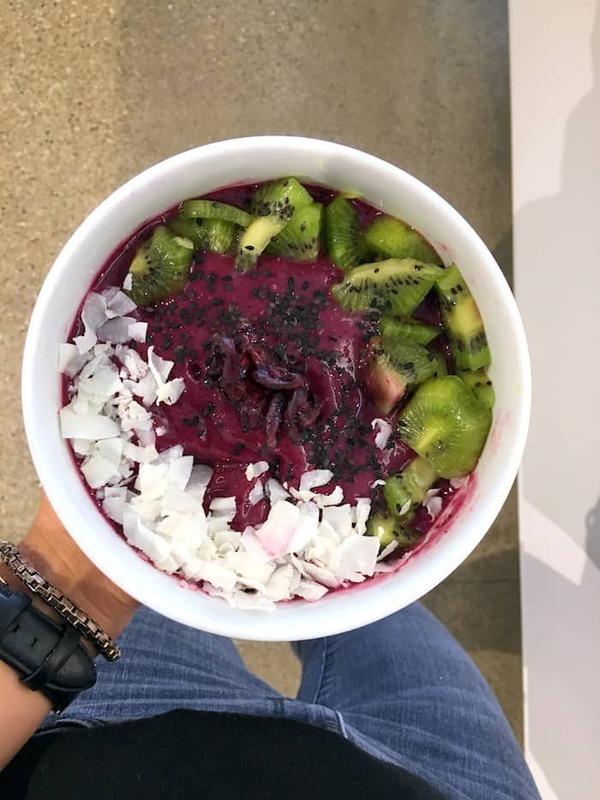 Despite the craziness of moving, your eats still look amazing! Oh man, I wish it would’ve been a donut!! 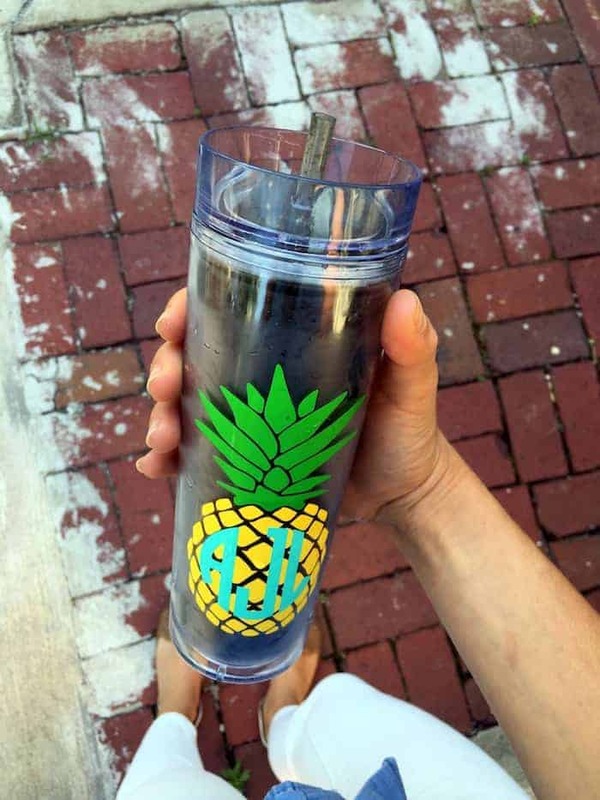 Do you by chance know where that smoothie tumbler came from? My sister would love that for her bday!